ENTERPRISE – A Washington County search and rescue mission yesterday resolved with the rescue of a man and the location of a woman deceased in a remote area in the Enterprise Reserve. The man, estimated to be in his 50s, and the woman, estimated at near to or about the same age, had been driving Tuesday night up a road that runs from the north end of the Gunlock reservoir area, heading north up towards the Enterprise reserve. It was initially thought the victims had a possible accident, Det. Nate Abbott of the Washington County Sheriff’s Department, said, but it has since been determined that the vehicle got stuck, became disabled and was not able to travel any further. Abbott said that the pair thought they were closer to Enterprise City than they were, exited the vehicle and set out north to try and reach Enterprise or locate people for help. Weather conditions worsened, Abbott said, and the woman could not go any further so they tried to give her shelter. The man continued on north for quite a significant distance until he was able to find some shelter – some kind of building or shack up near the reservoir, Abbott said – where he remained until the weather cleared and he could get out again. At that point, he continued on until he ran into people on snowmobiles, and emergency assistance was called. Abbott said the Sheriff’s Department was contacted sometime midday, around noon. Washington County Search and Rescue Team, Enterprise Fire Department and the county sheriff’s investigators participated in the search, the latter because a potential fatality had been reported, Abbot said. Although Abbott did not know the exact nature of harm or injuries to the man, he said that he was fine and appeared to have some exposure issues. Identification was pending last night and release of names of the two involved is being withheld until notifications have been made. Additional resource: Please visit Washington County Search and Rescue’s website which includes a wealth of informational and survival related safety tips relevant to the Southern Utah desert region. “On December 19, 2012 The Washington County Sheriff’s Office responded to assist in locating a stranded vehicle and two passengers located on the Shoal Creek Road, south of the Enterprise Reservoir. The male and female had been traveling north on the Shoal Creek Road the previous evening. Their vehicle became stranded due to the adverse weather conditions. The male and female exited the vehicle and began walking north on the road. The female stopped and could no longer continue. The male continued on seeking assistance. 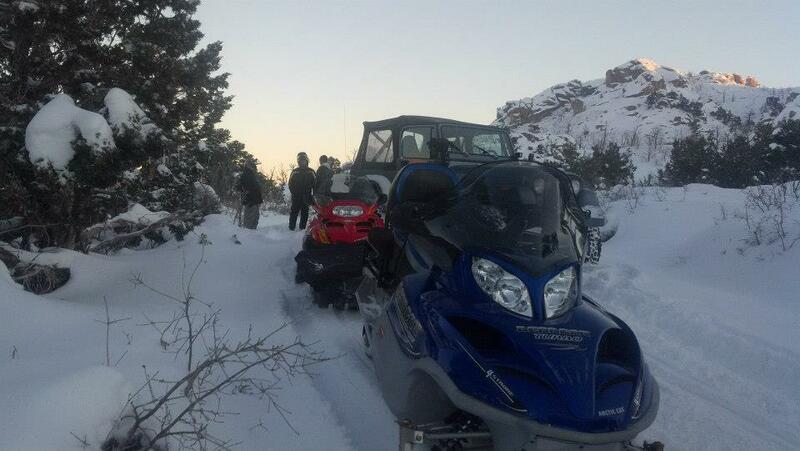 The male passenger, Michael Meunier, was found near the Enterprise Reservoir by individuals on snow mobiles. Volunteers with Washington County Search and Rescue and the Enterprise City Fire/Rescue/EMS responded and assisted deputies in locating the stranded vehicle and female passenger. The female, Darlene Dietrich, was found deceased in the snow approximately three miles north of the vehicle on the Shoal Creek Road. Yes, always stay with the vehicle. Also, I can’t imagine leaving her and then staying overnight before trying to get help. But that’s just me. I urge people to carry a backpack with emergency supplies in your vehicle,and you are correct stay with the vehicle . My emergency kit (,homemade) contains water ,food(,dried fruit ,protein bars,hard candy) and hand cranked radio with phone jack,flashlight,whistle,multitool w a knife ,plastic bags (large and small), batteries,a first aid kit and survival sleeping bag. I also carry a pair of plastic boots,heavy socks and waterproof gloves and scarf. Staying warm,dry and hydrated are critical until help arrives. This is definitely a tragedy. I want all to know that read this that Darlene was one of the most amazing ladies I have ever met. She put her heart into everything.She is missed by hundreds of her adopted theater grandchildren who will always remember and miss her. We love you Darlene!